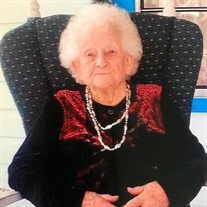 Mrs. Thelma Starling Moss, 98 of Starke passed away peacefully Saturday, October 20, 2018 at Haven Hospice House of Orange Park after an extended illness. Mrs. Moss was born in Starke where she lived all her life. She was a homemaker. She enjoyed her garden and attendance at Church. She was preceded in death by her husband William Frank Moss; her son Leslie Moss; her parents Benjamin James Starling and Daisey Starling; her sister Vera Lee Nugent. 1 Daughter: Elaine George of Starke. Lee Moss (Charlene) of Gainesville; Ronnie Moss of Starke. 2 Sisters: Ardelia Gossett of Starke and Eunice Gunter of Starke. Many grandchildren, great grandchildren and great, great grandchildren. Funeral services will be held Thursday, October 25, 2018 at 11:00 A.M. at the Airpark Baptist Church of Starke with Pastor Arthur Masters officiating. Burial will follow at Crosby Lake Cemetery in Starke. Visitation will be on Wednesday, October 24, 2018 from 6 P.M. to 8 P.M.
at Archer Funeral Home of Lake Butler.